All philosophical musings and deep words have been pried out of me by this miserable excuse of a day. So, in an effort to keep this blog from becoming a complete vehicle for my pointless rants, I’m going to try to avoid saying too much. I think I’ve already said too much. I don’t know if you remember the pistachio butter I made awhile back or that I said it was insanely strong. I did though and it was. I am happy to report I have found a most perfect of uses for it. 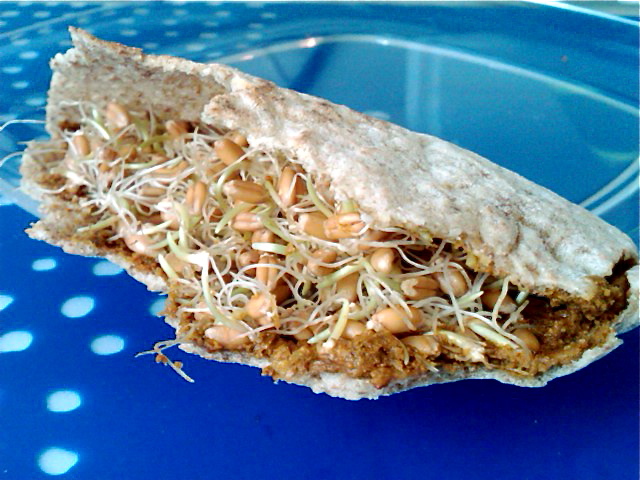 Green sprouted wheat berries. Opposites attract and these two are certainly opposites in flavor; but, don’t forget, birds of feather flock together–for that we have the intensity of said flavor. A couple years ago, when I still lived in the dorms and had to spend all of Christmas break at my parents’, my mother went to India. This left me, my dad, and my (then) 8-year-old brother to fend for ourselves against the evil that is the Costco “traveling shows”. If you haven’t heard about these, consider yourself lucky. The idea behind the “traveling show” is the same as the idea behind samples (give them just a little taste and they’ll buy it), but bigger. Much MUCH bigger. What these clever little companies do is send in a salesperson with the product. So you have someone actually “selling” the product to you. It’s like an interactive TV ad…with food. The show that year happened to be the Vitamix. Yes, ladies and gentlemen, it’s a $400 blender. And, yes, that is a beyond exorbitant price to pay for a blender (NO MATTER WHAT IT DOES). My dad, my brother and I stood in front of the Vitamix stand for over an hour, allowing ourselves to be sucked into the lady’s sales pitch. People came and people went: they were smart enough to treat it like any other sample–take the smoothie (or whatever else there was), consume it, and leave the area. My family and I, on the other hand, were like moths to a flame. As you probably have guessed by now, we bought the blender and, being the foodie of the house, it became mine. As you ALSO might have guessed, I’m not that fond of it. You see, it has a lot of….issues. I think the biggest problem is the cleaning. Cleans itself? Ha! I wish. Instead, only the area around the blade gets cleaned and you have to scrub the rest by hand. So why not put it in the dishwasher? Oh wait, you can’t! How convenient. I could ramble on about the problems with the Vitamix but, three years later, that seems pointless. For better or worse, I am now in possession of a $400 blender and (solely out of guilt, I assure you) I’m going to use it at least once a year even if it kills me. This isn’t your ordinary (eat-off-a-spoon) nut butter. Instead, it’s taste is EXTREMELY strong, meaning you only have to use a little to get an intense pistachio flavor. I decided to leave this one free of any extra sugars or other seasonings to really let the pistachio shine through, but, as always, you can do as you please. →In a blending/grinding apparatus, whiz the wheat bran and flax seeds (this makes it so the flax seeds are digestible and the wheat bran’s texture unnoticeable). Add the pistachios and blend/grind until it forms a butter. (I’ve never made nut butter in a food processor, but I’m pretty sure that the nuts form a ball before they become “butter”). 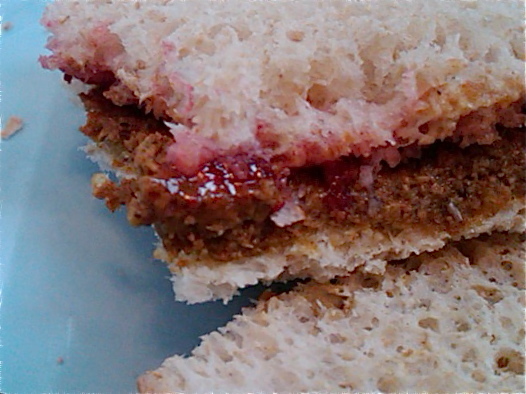 Make yourself a sandwich with a small amount of the nut butter and enjoy. 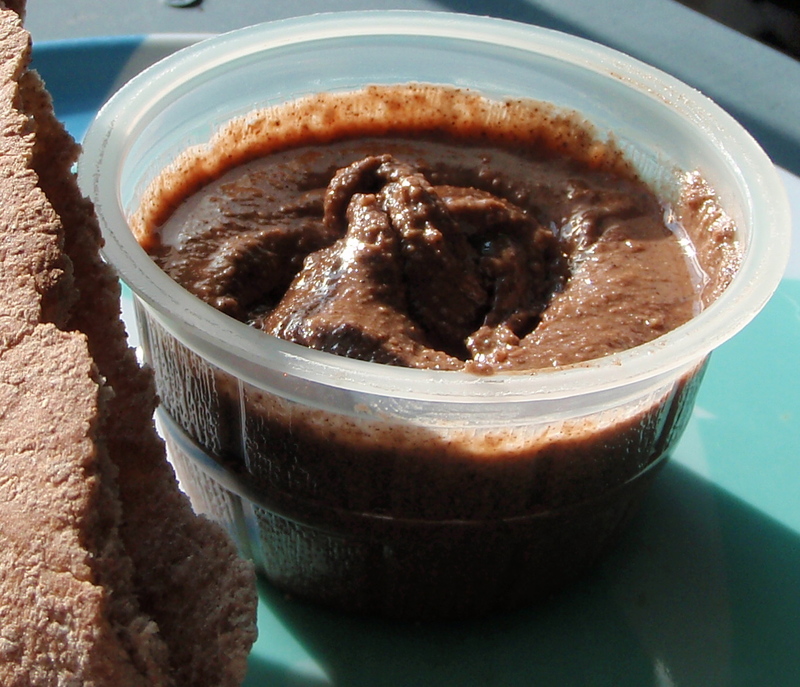 Did you know the main ingredient in nutella is sugar? 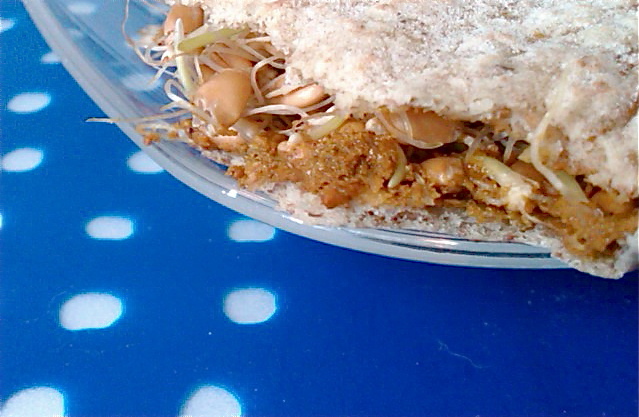 I find that rather bothersome…Although there’s no hazelnuts in this version, it is rich in almonds and not sugar. Win, win! →In a blending/grinding apparatus, whiz the wheat bran, flax seeds, cocoa and hot chocolate mix (this makes it so the flax seeds are digestible and the wheat bran’s texture unnoticeable). Add the almonds and blend/grind until it forms a butter. (I’ve never made nut butter in a food processor, but I’m pretty sure that the nuts form a ball before they become “butter”). Quickly transfer it to a storage container to avoid eating the entire batch. If you’re lucky enough to have avoided (or never encountered) the sales trap of the Vitamix road show, I recommend using a food processor. →It’s really simple. Put the ingredients into a food processor container or very high-quality blender (I have a vita-mix) in the order listed and whiz away! SO much better than the store bought Nutella which is 99% sugar. Uh-oh…I think the melatonin I took is starting to kick in. I’ll have to do the stir-fry later. In the spirit of the (probably short-lived) streak of good weather we’re having, I thought I’d post another ice cream recipe. This one needs an ice cream maker to really get the feel you’re going for, but on the plus side, it’s a great way to stretch that peanut butter flavor farther for fewer calories. Ice cream like substances are one of my favorite pseudo desserts. Not only for all the same reasons kids scream for it, but also because it seems so apt to pseudo-izing. See, ice cream/frozen yogurt isn’t like cookies or chocolates…it’s not DESIGNED to be unhealthy. In fact, the basic principles behind ice cream are the same as a smoothie and, like most other healthy foods gone bad, the difference between diet friendly ice cream and ben and jerry’s is the same as the difference between a smoothie and a milkshake. Every ice cream starts the same: dairy, to which is added sweetener and flavorings (there are some ice creams where you add eggs and what not but that’s just too much of a pain for me). You do need a minimal amount of fat for texture, but, as in my other frozen yogurt post, this can usually be worked around by using some chemical additive. Mix everything together and let the machine do the work. Or you could pour it into a tray, put it in the freezer and stir it every 30-60 minutes. If you use the 8th Continent Light Original, calorie free maple syrup and Naturally More peanut butter the entire pint comes out to 450 calories….not bad for a pint of ice cream. Apparently, no one has any recipes they’d like redone so I can ramble on about peanut butter and fake meat without guilt. Speaking of peanut butter, I was at Wal-Mart yesterday (yes, I shop at Wal-Mart, and, yes, I do know they’re bad for the economy and all, but they have a lot of stuff that’s hard to find in other places) and I found a new “like substance” to add to my collection. It’s called Naturally More and it tastes like Jif’s peanut butter with honey but has far less sugar and fat. Needless to say, I got a little too excited and bought 3 jars, which I realized (the moment I walked in the door) was way more than I should be eating off a spoon. So I developed a recipe…sort of. It’s really too easy to be called a recipe, more a harmonizing of ingredients to create a meal. Quickly. I love peanut butter. I am one of those people that sits in front of my computer reading about the salmonella scare with nothing but a jar of peanut butter and a spoon–a very large spoon. Unfortunately, I am also one of those people who is constantly on a diet in a vain attempt to reshape my body to fit society’s standards. Equally saddening is the fact that, while everyone seems to have a misconceived notion that peanut butter is “healthy,” it really isn’t (it is, after all, butter). Fear not! This story of peanut love has a happy ending. I realize it’s not peanut butter (exactly), but believe me when I tell you it’s much better and much more fun to eat off of a spoon. Not to mention there’s no worry over that whole salmonella thing. 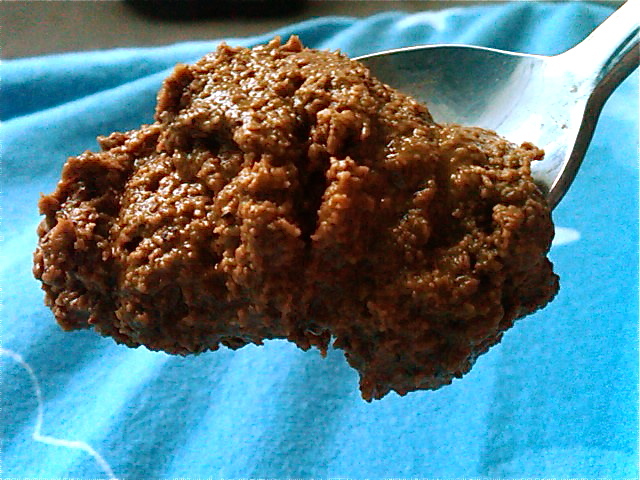 → Put it all in the blender or food processor in that order and blend till it looks like really thick nutella. I have to admit it’s a little sticky and hard to spread, but at 1400 calories for the entire batch, who can complain?